The fine line between folk and Americana becomes nicely blurred. Over the last few years, I’ve seen Lesley Roley perform several times and she is charm personified. She has a nice line in story-telling and a bag fill of introspective and beautifully structured songs. But, this is the first time I’ve listened to her on disc in the comfort of my own home, and what a pleasant experience it’s been. After a few listens now, I would file this album in the lo-fi section alongside the Cowboy Junkies and Fleet Foxes. The production is simple and crystal-clear, allowing Roley’s warm voice to permeate the airwaves like a siren in a Greek tragedy. Most of the songs are just Roley and her sophisticated guitar playing. “Little Bit” stands out as it offers a piano and guitar plus her voice, which was multi-tracked to create delicious harmonies. It’s an enchanting song that deserves to be heard by a huge audience. The charming “If” is as poetic as it is hypnotic, conjuring up uncanny memories of the singer-songwriters of my youth, like Joni Mitchell and Melanie. 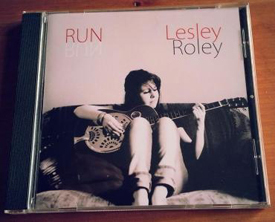 The title track “Run” opens with some delightful piano playing, as Lesley begins pouring her heart out. You can picture the pain that must be etched on her young face as the words glide from of her lips. Perhaps because I was in a dark place when I first heard it, but I absolutely love “Mr. Sad”, with its soft, jaunty beat and backing singers who must have arrived directly from a Leonard Cohen session. Run isn’t always an easy listen and will appeal to people at the end of a relationship, who need the comfort of knowing that they aren’t the only person in the world with a broken heart.